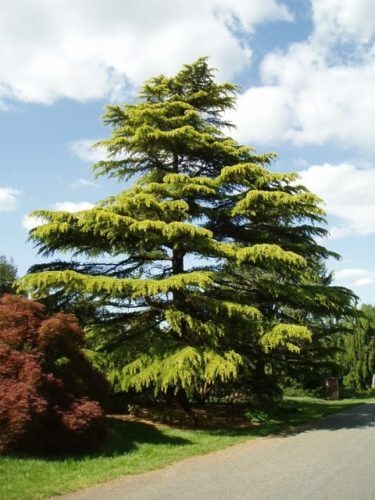 Cedrus deodara 'Aurea,' the Golden Himalayan cedar is a large-growing tree form with striking horizontal branches and nodding tips holding long, soft golden foliage. Fresh spring growth is creamy yellow. Even though the tree is fairly slow-growing, it is definitely not a dwarf conifer. For best color, site plants in full sun in well drained soil. In shade, the gold will not show and the tree will be basically green in color. After 10 years of growth, a mature specimen will measure 12 to 15 feet (4 - 5 m) tall and 7.5 feet (2.5 m) wide, an annual growth rate in excess of 1 foot (30 cm). 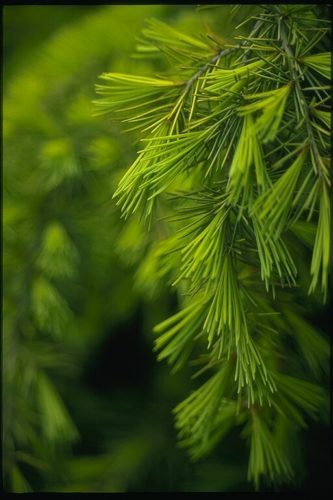 Golden Himalayan cedar is a very old cultivar in the international nursery trade. British botanist J. Nelson first described the plant in botanical literature in 1866. It is quite likely that several clones are lumped into this cultivar name. In the Latin language, "aurea" translates into "gold or golden." Cedrus deodara 'Aurea' — a closeup of foliage detail. Cedrus deodara 'Aurea' — branch detail. 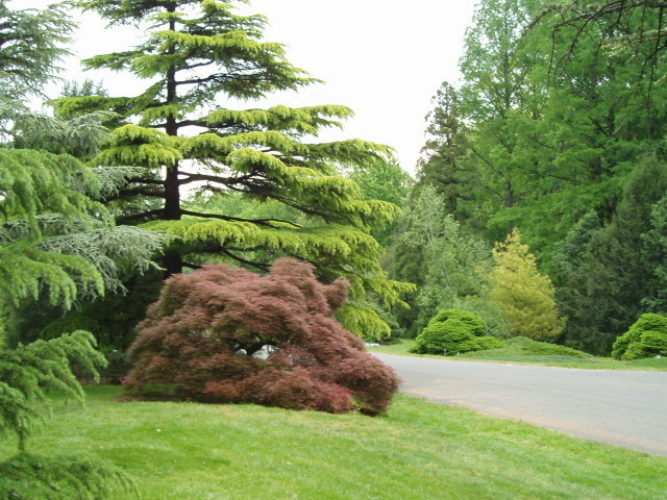 Cedrus deodara 'Aurea' — in the Gotelli Collection at The US National Arboretum in Washington, D.C., May 2006. Cedrus deodara 'Aurea' just past Acer palmatum 'Ornatum' at the entrance of the Gotelli Conifer Collection in Washington D.C. at the US National Arboretum. Photo taken May of 2006.